This damage was caused by a grease fire. 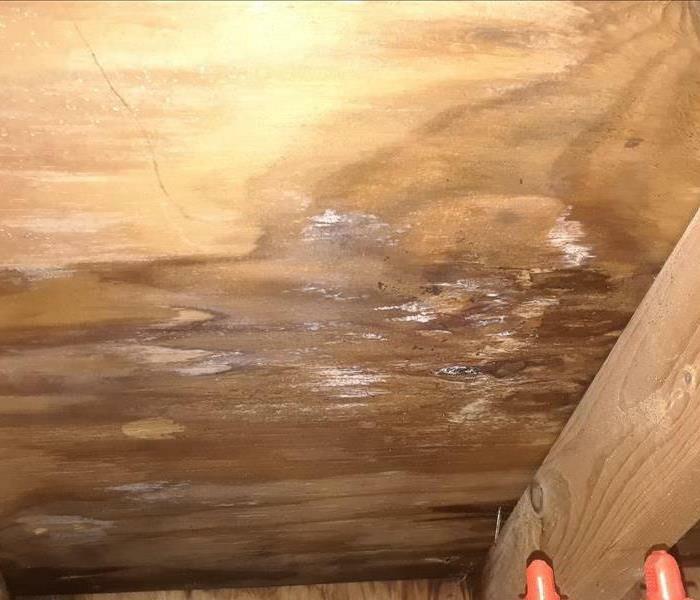 Mold takes root on a moist spot on a wooden ceiling. Even the best building designs are put to the test by mother nature. This time in the form of hail. The internal gutter system of a technologies facility in the Mount Joy area became clogged when quarter sized hail rained down as violent thunderstorms devastated the area overnight on March 1st. 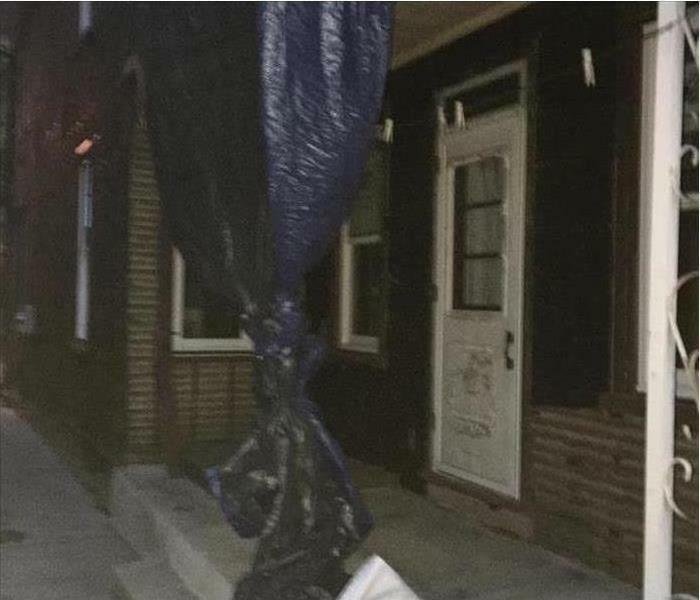 Storms so severe it appeared that a tornado had touch down in the Susquehanna Valley. With a mixture of ingenuity, and professional know how; our technicians assessed the damage that resulted from the overflow of rain water throughout the facility, and quickly took action. With minor disturbance on the office staff, and shop employees, the Mount Joy based technologies company was able to remain open, and in full swing of operations. A valuable asset to any company is knowing that though the situation seems bleak, it's no match for the professional training SERVPRO technicians have. Till next time Mother Nature, as SERVPRO East York stands strong for the community. Flooding and water damage events at York County commercial properties are often complex with numerous issues that require a knowledgeable and flexible response. Whether we’re dealing with a relatively small water cleanup scenario or a large scale event, we work quickly to assess each unique situation and isolate the damaged area. In many instances, normal operations can continue in a temporary space while we restore your facility. SERVPRO of Western Lancaster specializes in the cleanup and restoration of commercial and residential property after a water damage event. Our staff is highly trained in property damage restoration. From initial and ongoing training at SERVPRO’s corporate training facility to regular IICRC-industry certification, rest assured our staff is equipped with the knowledge to restore your property. 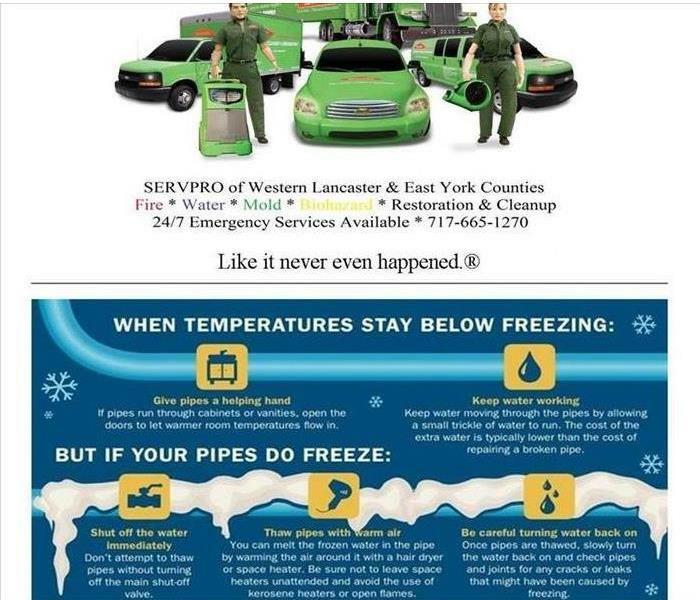 SERVPRO of Western Lancaster is available 24 hours a day for water emergencies, large or small. When you are dealing with water damage, immediate action is crucial. A delay of just a few hours can greatly increase the severity of the water damage. We understand that when you call us, you may be feeling confused, stressed, and vulnerable. You need an expert to guide you through this crisis. SERVPRO of Western Lancaster has the specific water damage training and experience to help you through this tough time. We specialize in water damage restoration—in fact, it's the cornerstone of our business. 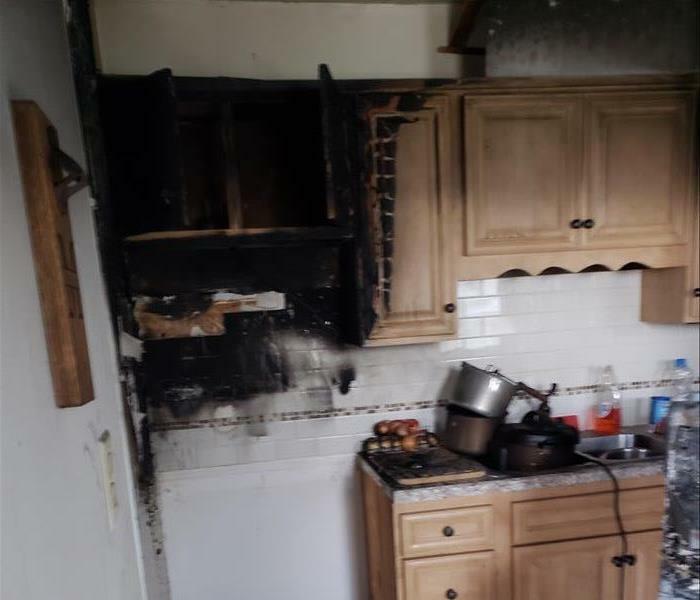 SERVPRO of Western Lancaster specializes in the cleanup and restoration of residential and commercial property after a fire, smoke or water damage event. Our staff is highly trained in property damage restoration. From initial and ongoing training at SERVPRO’s corporate training facility to regular IICRC-industry certification, rest assured our staff is equipped with the knowledge to restore your property. When Storms or Floods hit York County, SERVPRO is ready! SERVPRO of Western Lancaster specializes in storm and flood damage restoration. Our crews are highly trained and we use specialized equipment to restore your property to its pre-storm condition. When storms hit Lancaster County, we can scale our resources to handle a large storm or flooding disaster. We can access equipment and personnel from a network of 1,650 Franchises across the country and elite Disaster Recovery Teams that are strategically located throughout the United States. If you suspect mold in your home, call SERVPRO of East York to assess the situation. We have the knowledge, tools and track record to effectively remediate mold in your home or business. How Ready Are You? We can help! When a disaster strikes, moments matter and pass more quickly than before, especially if one isn’t prepared. Preparation could be as simple as knowing the locations of utility shut offs such as electric, gas, or water and emergency contact numbers. A step beyond that is having that information at your fingertips instead of sitting in a drawer in the office—which may not be reachable in the event of a fire or damaged by flooding. 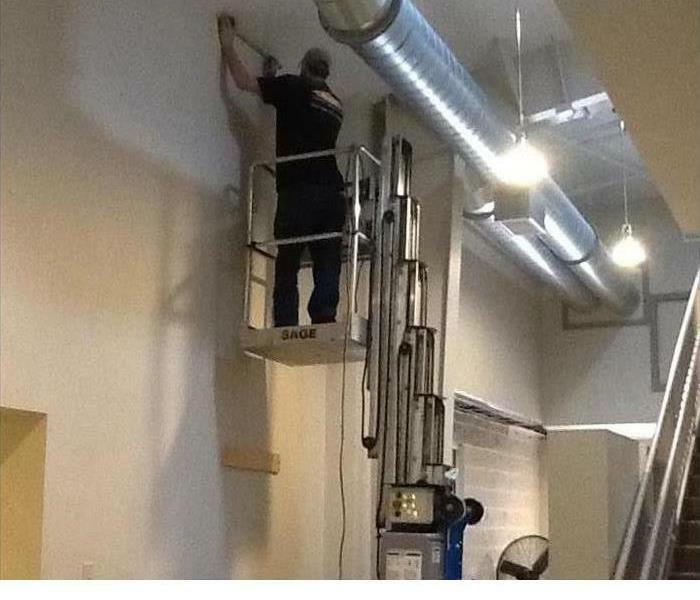 These situations are precisely why SERVPRO created the free Ready Plan app for Android and iOS. With it, you can access all your emergency information instantly when disaster strikes. The setup is simple, intuitive, and highly customizable to what your individual needs are. Want to share emergency information with a manager or head of maintenance? Need immediate response because a pipe or radiator broke? All available at the push of a button. Getting prepared doesn’t have to be hard, download the free Ready Plan app today and see just how easy it is to create a plan for whatever happens. More information and PC access available at ready.SERVPRO.com. If you have any questions or need help getting prepared, please e-mail me at Yuriy@SERVPRO10454.com. 3/15/2018 - When Storms or Floods hit York County, SERVPRO is ready! 3/15/2018 - How Ready Are You? We can help!